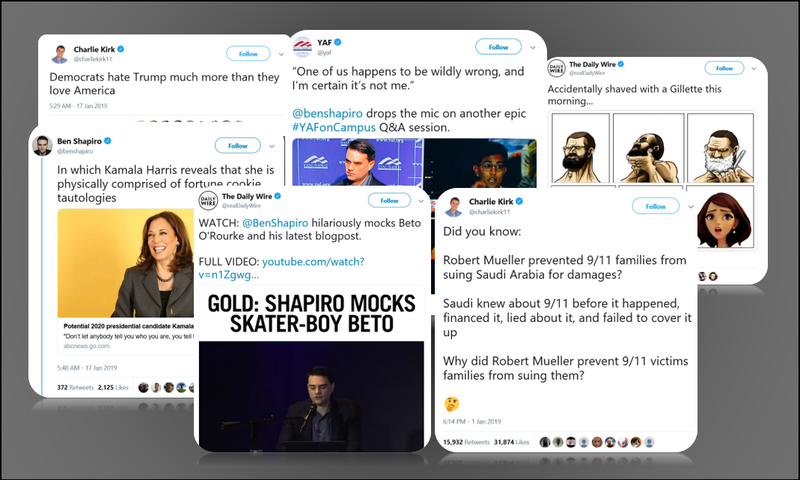 Above are just some recent highlights of the bite-sized “conservatism” served up these days by the Twitter networks of Ben Shapiro and Charlie Kirk. They are two of the most prominent voices among next-generation Republican talkers today. I say prominent voices because even the unimpressed observer has to give Shapiro and Kirk their due. They have cracked the code of online virality. Their missives are seen by millions each day. Their staffers follow them around with cameras waiting to capture the next tweet-worthy exchange with an overeager college freshman sporting a nose ring and a Che Guevara t-shirt. But, instead of championing our principles and marketing them to the masses, Shapiro and Kirk are actively downgrading conservatism in pursuit of clicks. We should resist their bait. Defenders of Shapiro and Kirk are satisfied with this state of play. They argue that “owning the libs” is an end unto itself. Certain factions on the left ridicule us, so why shouldn’t conservatives traffic in constant mockery as well? For their part, Shapiro and Kirk have seemingly dedicated their media enterprises to this creed. And their followers eat it up. That Shapiro and Kirk’s business fortunes have swelled alongside the rise of Trump’s unfiltered nationalistic populism should come as no surprise. What Trump marshaled for power, Shapiro and Kirk have marshaled for profits. But if building a durable conservative movement for the future is truly the goal, their current strategy is woefully lacking. It’s an easy game to make jokes at the expense of your ideological adversary for a crowd paying for entertainment — but convincing folks who disagree to adopt your vision is a harder sell. For all of their success at the former, Kirk and Shapiro would do well to try their hand at the latter — preferably while sparing us the heavily edited, shock-and-awe video of it after the fact. The clickbait conservatism they currently peddle is insulting to the intellectual legacy of Burke and Buckley. Unconvincing and uninspired, its manufactured barbs and reactionary own-the-libs angst adulterates our principles and replaces them with rudimentary tribalism. Instead of advancing fresh ideas and thoughts, clickbait conservatism advances whatever the masses demand and devolves our discourse on the right into resembling what one might overhear in a high school cafeteria. So what instead? The future version of conservatism — or whatever right-of-center ideology emerges from the ashes of Trumpism — must be bigger than homemade memes. It has to aspire to more than simply winning a war of retweetable jabs with our political opponents. In the same way that the left will fail if all it does is stand against Trump, conservatism will fail if all it does is own the libs. We, as conservatives, have to believe in bigger ideas again. When we traffic in clickbait conservatism, our values — like opportunity, individual responsibility, and limited government — are cheapened, if not wholly obscured. The leaders of tomorrow we need are the ones willing to fight for our ideas the hard way: offering a vision of conservatism that will change hearts and minds by directly addressing the concerns of others with principle and respect. The challenge will be finding a way to champion our ideas via the modern mediums that Kirk and Shapiro currently dominate. If we fail, the true cost of all the clickbait will be a generation of conservatism that actually wins the argument.